The apple tree (Malus pumila) is a deciduous tree in the rose family best known for its sweet, pomaceous fruit, the apple. It is cultivated worldwide as a fruit tree, and is the most widely grown species in the genus Malus. 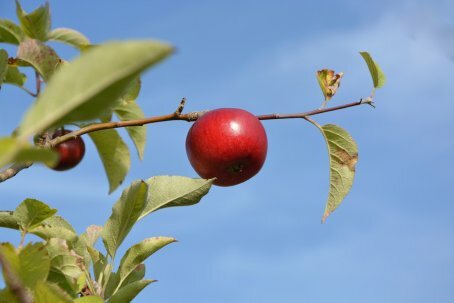 The tree originated in Central Asia, where its wild ancestor, Malus sieversii, is still found today. Apples have been grown for thousands of years in Asia and Europe, and were brought to North America by European colonists. Apple trees are large if grown from seed. Generally apple cultivars are propagated by grafting onto rootstocks, which control the size of the resulting tree. There are more than 7,500 known cultivars of apples, resulting in a range of desired characteristics. Different cultivars are bred for various tastes and uses, including cooking, eating raw and cider production. In 2010, the fruit's genome was sequenced as part of research on disease control and selective breeding in apple production.